Department of Chemistry, Government Sanjay Gandhi (Autonomous) College, Sidhi, Madhya Pradesh, India. The demi-macrocyclic ligand complex of Fe(II) ions contain N and O as donor atoms was synthesized and by FTIR and UV-Vis. Spectroscopy. 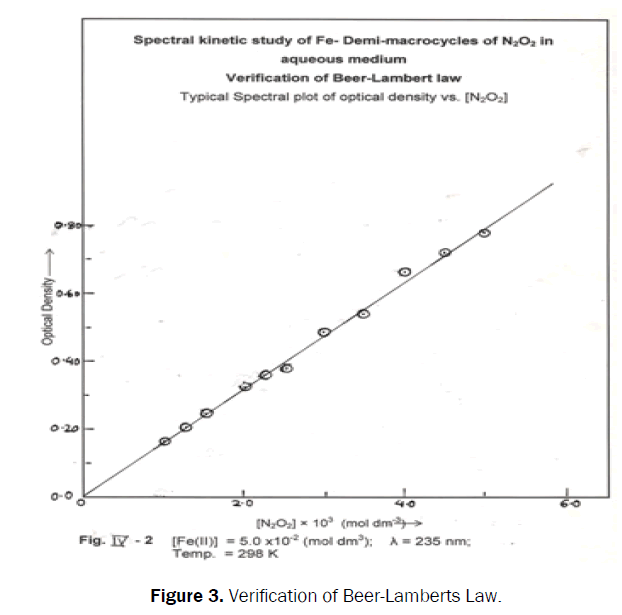 The magnetic susceptibility of the complex was measured and rate was determined spectrophotometrically to verify Βeer-Lambert law at required wavelength 235 nm. The effect of pH on reaction velocity was studied. The mechanism and rate law of complex formation in consistent with the activation parameters were evaluated. The macrocyclic and demi-macrocyclic ligands largely show vast and wide applications in various fields such as nuclear medicine, pharmacology, industry and analytical chemistry [1-4]. The natural macrocycles have been studied in considerable depth for stereochemical constrains resulting from their cyclic nature [5-7]. The metal ion is too large to fit in, to the available macrocyclic hold provided complexation occurs by either folding of metal ions or its displacement from the donor plane of the ring. It may be energetically unfavorable for their counterparts in which metal ions binds axially [8-21]. Macrocyclic ligands may also promote the formation or less coordination geometrics for particular metal ion because of increases ring strain on coordination. All materials in this probe were of AR-grade, BDH and Merck chemicals company. The C, H, and N elemental analysis of the sample was carried out microanalytically. Oxygen was determined by different methods, Fe(II) and chloride were determined gravimetrically. 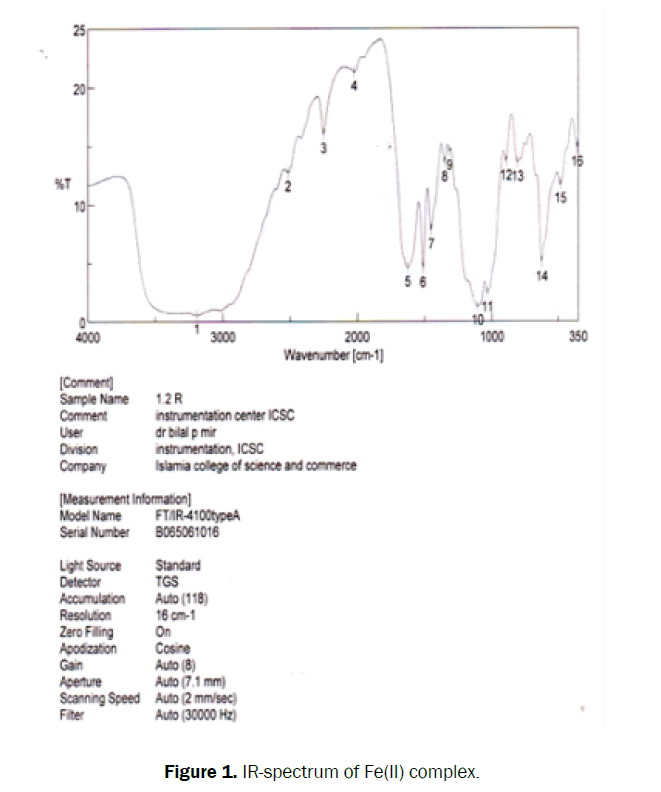 The IR spectra (4000-400 cm-1) were recorded on a Jaco model 4100 FTIR spectrophotometer as Kbr disc. whereas UV- visible spectra was recorded on shimeszu 1700. The conductivity measurements was made in DMSO or nitromethane (10-3 mho) at room temperature on Systronics conductivity meter at 8000 G in a Evans as magnetic susceptibility balance using Co[(Hg (SCN)4] as calibrant. The experimental susceptibilities were corrected for diamagnetic complex as pascal constants. Ethane 1, 2-diamine (30 g) was added to acetone (300 ml) in a 500 ml flask and the solution cooled in an ice-bath perchloric acid (72%) keeping, the temperature below 20°C. After few hours, fine crystals of the product was obtained which is insoluble in acetone, washed and vanished. The product was remained colorless and was air dried. The yield was obtained 85%. Iron (II) perchlorate (10 gm) was dissolved in methanol followed by [amke+H2 (ClO4)] (24 gm, 0.052 mol) the mixture was refluxed. Until the color of the solution changed from green to reddish brown. After sometimes, the product was filtered recrystallized from methanol and evaporated to dryness in vacuum. Figure 1. IR-spectrum of Fe(II) complex. The non-appearance of Vs(N-H), Vas (N-H) complex confirm the coordination of metal ion by the deprotonation of the internal protons. UV-vis. electronic spectra of the Fe(II) complex shows split single absorption band at 9700 cm-1 and 8690 cm-1 assignable to 5T2 → 5E transition in the ligand field of near on symmetry the D free ion ground state term splits into 5T2g ground state and 5Eg excited state. Accordingly the electronic spectra display only one spin-allowed band in the visible or near IR region. The intense CT band at 28500 cm-1 is assigned to ligand to metal C.T. (Figure 2). Figure 2. Wave number (cm-1) UV Spectra of Fe(II) complex. The measured magnetic moment of the Fe(II) complex is in good agreement with high, spin octahedral complexes. Its value is equivalent to 5.68 B.M. The molar conductance values (λmax =5.152 cm2 mol-1) of the complex in DMSO (103 M) indicates the non-electrolyte nature. Kinetic measurements were monitored spectrophotometrically using maximum absorption peaks at 235 nm absorption peaks at 2135 nm. A Cary model 170 dual-beam recording spectrophotometer for kinetic measurements involving both the and durum spectrophotometer at 25.0+0.2°C using circulating temperature both for all measurements, ionic strength was maintained at 0.15 M. The Beer-Lambert law [16-18] was verified from the spectral kinetic data obtained as in Table 1 (Figure 3). Figure 3. Verification of Beer-Lamberts Law. Table 1. Effect of variation of concentration of N2O2 (Donor ligand) on the rate formation of demi-macrocyclic complex of Fe(II) in aqueous medium. It is found that the increase in concentration, slightly increase the rate in the pH range from 6.55 to 9.80. The increased rate constant k1, should be much smaller than that of observed experimentally. When pH range 6.55 to 9.80 are used, the linearity of plot (Table 2). Df-Dt/time or kobs vs. [Fe(II) × 102 (mol dm-3)] or [N2O2 × 103 (mol dm-3)] for the complexation was found that, rate of reaction increases with increase in pH whereas plot of kobs versus pH gives non-linear, slightly curve type graph (Figure 4). Figure 4. [N2O2]=5.0 × 103 (mol dm-3); Fe (III)=5.0 × 10-2 (mol dm3); λ=235 nm; Temp=298 K.
Table 2. Observed first-order rate constant kobs (s-1) for the Fe(II) demi-macrocyclic complexes with N2O2 under various pH conditions. This is an excellent in conformity with the experimental kinetic facts of Fe(II)- demi-macrocycle with N2O2 complex. Synthesis and spectral studies of demi macrocycles of donor ligand with complex of Fe (II) ion was synthesized the elemental analysis, magnetic susceptibility, FTIR and UV spectra revealed the formation of demi-macrocycles complex. Octahedral structure was assigned of Fe (II) complex ion on the basis of elemental and spectral data. Tyagi M, et al. Modern spectroscopic technique in the characterization of bio sensitive macrocyclic Schiff base ligand and its complexes: inhibitory activity against plant pathogenic fungi. Spectrochim Acta A 2014;118:1056-1061. El-Boraey HA and EI-Gammal OA. Synthesis, characterization, molecular modeling and antimicrobial activity of 2-(2-(ethylcarbamothioyl) hydrazinyl)-2-oxo-N-phenylacetamide copper complexes. Spectrochim Acta A 2015;138:553-562. Chun KM, et al. Self-Assembly of a 1D Hydrogen-Bonded Polymer from a Hexamethyltetraaza Macrocyclic Nickel(II) Complex and Isophthalic Acid. Polyhedron 2001;20:65. Khan TA, et al. Synthesis, Spectral and Kinetic Study of Demi-macrocycle of N2O2 with Complex of Co (II) Ion. J Co-ordination Chem 2010;63:4411-4420. Rossignoli M, et al. Metal-directed syntheses of dithiadiazacyclotetradecane macrocycles with pendant alcohol and nitro or carboxylate groups involving macrocycle ring expansion. J Chem Soc Dalton Trans 1997; pp: 323-327. Mewis RE and Archibald SJ. Biomedical applications of macrocyclic ligand complex Coord. Chem Rev 2010;254:1686-1712. Siddiqik KS, et al. Theoretical study on physicochemical properties of curcumin. Spectro Chim Acta 2007;67:995-1002. Singh DP, et al. Synthesis and Characterization of Polydentate macrocyclic Schiff bases (14-membered atoms) and their complexes with Co (II), Ni (II), Cu (II) and Zn (II) ions. Arab J Chem 2013; p: 9. Dilip AM and Bilewiez A. The role of copper and protons in heme-copper oxidases: Kinetic study of an engineered heme-copper center in myoglobin. J Inorg Bio-Chem 2011;105:313-320. Wang Q, et al. Synthesis of Macrocyclic complexes and their Spectroscopic and Thermal investigation. J Solid State Chem 2009;31:182. Wilkins RG. Allyn and Bacon. Boston Mass 1974; p: 25. Charles J, et al. J Am Chem Soc 1975;2:6701-6707. Mary L, et al. Inorganic Chemical Acta 1945;230:51-57. Smith JM, et al. Electronically Unsaturated Three-Coordinate Chloride and Methyl Complexes of Iron, Cobalt, and Nickel. Organometallic 2002;21:4808-4814. Chandra S and Gautam A. The study of linear solvation energy relationship for the reactivity of carboxylic acids with diazodiphenylmethane in protic and aprotic solvents. J Serb Chem Soc 2009;74:1413. Ozarwski A. Programmable Fluidic Production of Microparticles with Configurable Anisotropy. J Am Chem Soc 2009;131:1027. Wilkin RG. Kinetic and Mechanism of Reactions of Transition Metal Complexes. 2nd edn. Wiley-VCH, UK 2002. Ansari M, et al. Study of complex formation between 18-crown-6 and diaza-18-crown-6 with uranyl cation (UO22+) in some binary mixed aqueous and non-aqueous solvents. Inclusion Phenon Macrocyclic Chem 2009;64:49-56. Rasheed S, et al. Kinetic and Mechanism of Complex Formation of Demi Macrocycles of N2O2 with Cr (II) and Co (II) Ions. Int J Adv Res Chem Sci 2018;5:102-110. Rasheed S, et al. Kinetic and Mechanism of Complex Formation of Demi Macrocycles of N2O2 with Cr (II) and Co (II) Ions. Int J Adv Res Chem Sci 2018;5:14-19. Rasheed S, et al. Kinetic and Mechanism of Complex Formation of Demi Macrocycles of N2O2 with Cr (II) and Co (II) Ions. Int J Adv Res Chem Sci 2018;5:3-9.